Work had been horrendous the past two weeks, and I needed a break. Specifically, I needed to go shopping. So I combined the two concepts, and snuck up from Seattle for a weekend in Victoria BC, to explore the shops for Christmas presents. Was that ever a great idea! I had stayed at a wonderful family hotel in Victoria before, and they were glad to hook me up with a room for a couple of nights. I needed to unwind first, so I spent a long time soaking in the hot tub at the hotel, followed by a wonderful dinner. 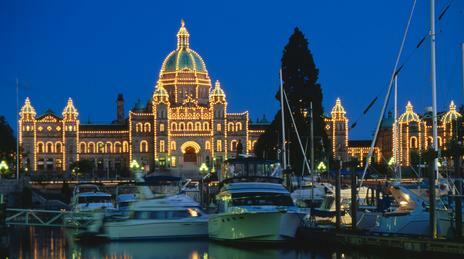 Having slept really well and already much refreshed, I was ready to explore Christmas shopping in Victoria. The staff’s suggestion for shopping nearby had been Uptown Mall, but I could find those in Seattle, and I wanted to experience local stores if possible. To enjoy a Victoria Christmas, Lauren at the hotel had enthusiastically told me that Government Street downtown was the place to be. She said it had lots of small and quaint shops, souvenir places, gift shops, and even a Christmas store. I took the short bus ride to Government Street, a narrow, quaint street with tons of personality. There were stately red and tan brick buildings fronted by wide cobblestone sidewalks, with lots of trees, and people walking around or seated at tables outside restaurants. It felt like streets in Tribeca, when we visited New York City. There was just a really delightful energy, and everyone looked contented and like they would have a happy Christmas in Victoria BC. I started exploring around 11 AM to get the lay of the land, but soon my stomach signaled I needed food. I stopped off at Bard & Banker for some really tasty fish and chips. I didn’t want to take long on lunch – I was having too much fun. I walked quickly past Roger’s Chocolates, lest I get distracted, but just south of View Street I ran across Old Morris Tobacconists. I wanted to find a pipe for Uncle Eugene, but looking at the extensive selection, I quickly realized that I didn’t know what kind of pipe to choose. The helpful staff asked me a few questions about his smoking habits, and quickly put me onto a custom blended pipe tobacco they said he would like very much. I had made my most difficult purchase for Christmas, in Victoria. I walked outside, and two doors down was Munro’s Books, housed in an old building just bursting with class and atmosphere – a white stone exterior framed by tall columns, heavy brass lamps and murals on the walls inside. A clerk told me the building was a bank in the early 1900s, and carried over 35,000 books. Just walking the aisles was relaxing. I made a mental note to watch the time – but it was difficult while surrounded by all those fine books. Then I found a hardcover copy of Hemingway’s For Whom The Bell Tolls that I knew would delight my husband. Score! Ten Thousand Villages. A sign said handcrafted products from around the world, and I knew this was my kind of place. The wonderful staff told me that being in their store was like a trip around the world, and that they sold artisan crafted personal accessories, home décor items and gifts. They offered me a coffee to sample before I visited the Rug Room. I glanced at my watch, and saw that it was now 5 PM. I was tired and knew I had lots more to explore as I was shopping for Christmas in Victoria. I hadn’t even made it to the Christmas store yet. I came home to the hotel that night tired, yet renewed, and excited about tomorrow’s adventure Christmas shopping in Victoria – straight back to Government Street for me. I already knew that when I was done, I would reward myself with a stop at Roger’s Chocolates. Every woman should own a maxi dress. If you are a woman and you do not have a maxi dress in your wardrobe you should consider buying one immediately. Why maxi dress? Well, there is a very simple reason. Anyone can wear a maxi dress. (Obviously, I am referring to women only.) It does not matter whether you are 50 or 30. It does not matter whether you are fat or thin. As long as you are a woman, you can wear a maxi dress.Occasion is another aspect women should think of. When you need to wear a formal dress you must not wear a casual dress. Also it must be known that for a casual event if you dress up with a formal dress like klädaffär you are not going to add any glamour on you. Your dress should also be in unison with the accessories you wear. Always remember to wear the matching shoes and matching jewelry. Even your wrist watch has to match with your Kläder på nätet. Therefore, it is a good idea to choose the right accessories. In fact, I like to call a maxi dress a wonder dress.